Inch perfect from the Costa Calida to the River Lune. 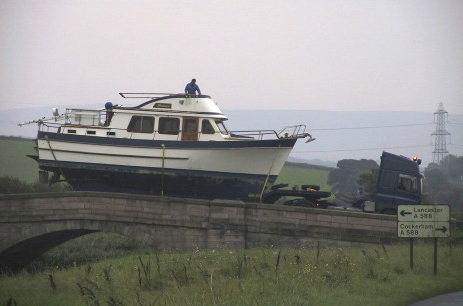 September 2008: When yacht owner Howard Gordon decided to bring his Formosa Eurobanker 42 HAMAR back from Torrevieja for refit at Glasson Dock on the Lancashire coast of the Irish Sea, Transboat driver Gary Cooke had to sling the 4.57m high flybridge cruiser on the beams of a low trailer with a ground clearance of only 30 cm, to clear low bridges outside San Pedro del Pinatar near the Mar Menor, Europe's largest salt water lake. The Eurobanker cleared the British motorway height limit by five inches. But two notorious humpack bridges lay ahead, on the last kilometre of the 2500 km journey - impassable to an ultra-low trailer. 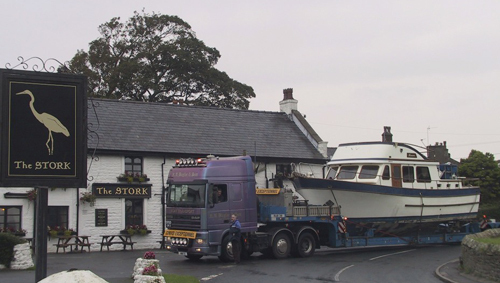 It took an ingenious transhipping job on the car park of the Stork Inn at Conder Green to get HAMAR into the workshops at the Glasson Basin Yacht Company. 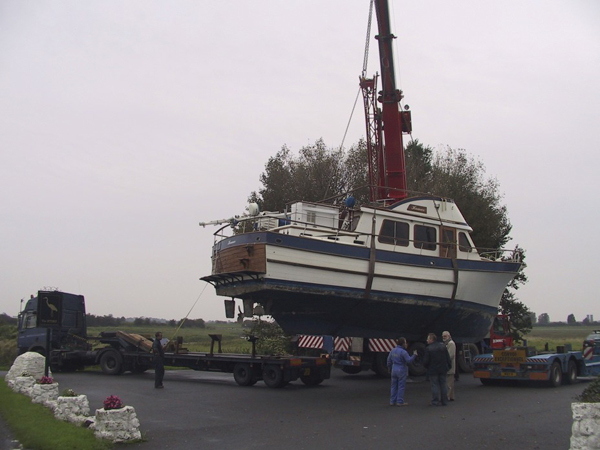 The plan depended on the generosity of South African-born restaurateur Tracy Fairbrother, who cleared the car park outside her ancient inn on the salt marshes of the River Lune and allowed Sealand Boat Deliveries to pitch a 50T mobile crane and reload to a second boat trailer, short enough to clear the humpback bridges over the River Conder and the Glasson branch of the Lancaster Canal. 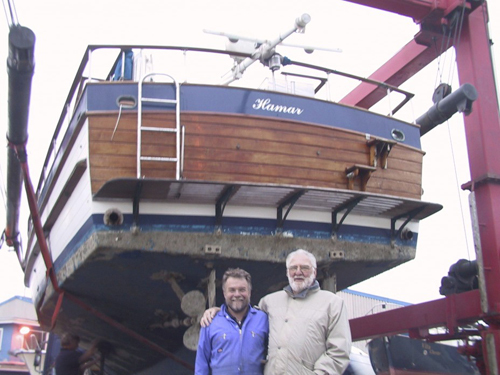 Gary Cooke [left] tells Glasson Basin manager Richard Byles and yacht owner Howard Gordon that after 2500 km, he will stay with HAMAR on the final kilometre. 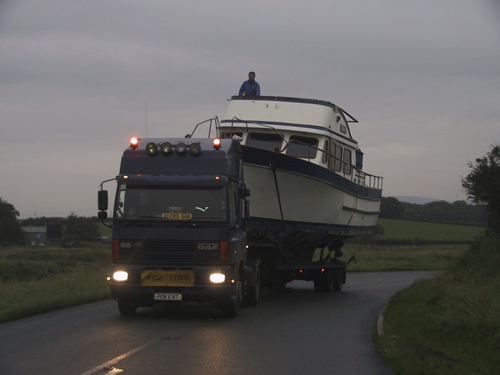 CLICK this picture for more boat transport news.